Trevor has volunteered at Emmanuel House for two years. We asked him about his experience with us. I was entering retirement and wanted to do some worthwhile voluntary work. A good friend of mine, Phil Knott, had been working in EH kitchen on Friday mornings for several years so I joined him and never looked back! What were your first impressions of the service? And the people in need of the service? My very first impressions were that it was good fun in the kitchen and how well I was welcomed into the team by Jo the cook. It was also clear that EH does something that is of great value to many people. The visitors come for breakfast but it is also clear that it is a lot more than that including friendship, a friendly environment and support and advice. My impressions of the visitors is that they are mostly very grateful for what they are getting. Which areas of volunteering have you experienced within EH? 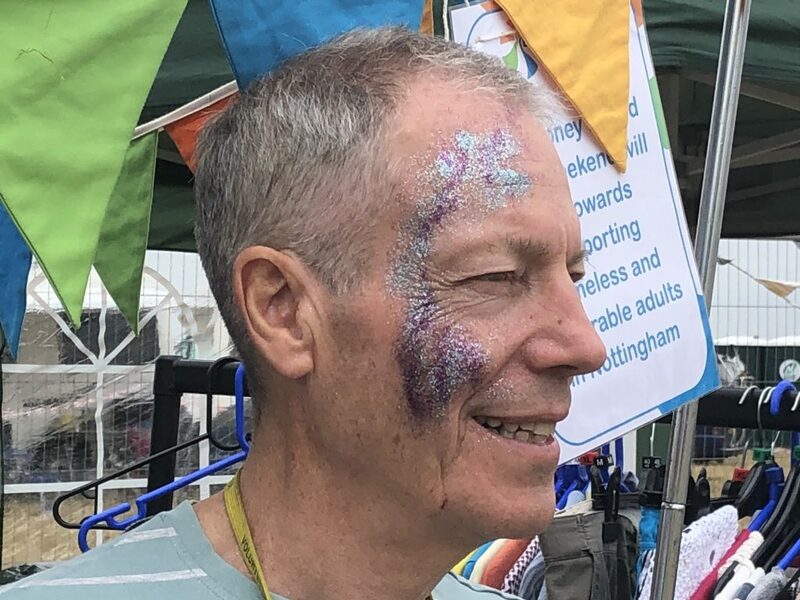 I have been a regular kitchen volunteer but I have also done one or two sessions helping at the support table (arranging washing, clothes collection etc), working at the Winter Shelter evening session and helping to look after a stand EH had at a Rock festival in East Bridgford. The Winter Shelter was completely different and particularly rewarding as you spend a lot of time with a few number of visitors. At the last session I was even playing games with them before they went to bed. A delight! I will be doing more of these. At the rock festival I had to learn quickly to do do face painting with my friend Phil. I love the comraderie in the kitchen and the banter with Jo and the other volunteers and the the regular visitors. Selfishly, I also get a lot from working as a volunteer at EH as it gives me a feeling of self satisfaction having done something worthwhile. It also reminds me what a privileged existence I have. Does volunteering add anything to your life? Yes, definitely. It’s an essential part of my weekly routine now helping me to ensure I’m doing something worthwhile for people. I have learnt a lot about what homelesness and loneliness means in practice. What would you say to anyone who is thinking of volunteering for EH? Come and spend a morning in a few of the areas within EH. I’m sure you’ll find something that suits you.